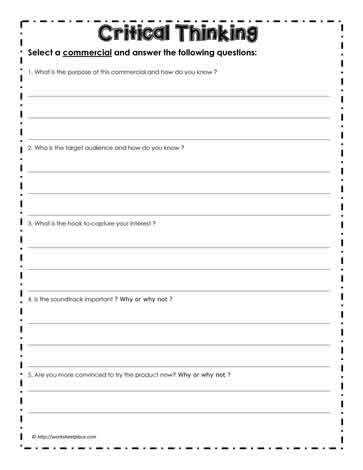 You can use any adverstisement with this media literacy worksheet. Media literacy encourages students to read between the lines in advertising. You can select a specific commercial or let students do the worksheet on a commerical of their choosing. OR, you may wish to have your students do the same commerical and then do a second commercial they watch from home. There are many deceptive commercials and our students should be able to understand the strategy the advertiser uses to grab their attention and make them want the product. This worksheet has students thinking deeper about what they see in commercials.